The German newspaper “Die Welt” announced that Russia actively seeks to get rid of dependency on the US dollar by purchasing gold and selling the bulk of the Moscow-owned US Treasury bonds. According to political advisor and author James Rickards, cited by the newspaper, the Russian government pursues “a strategic plan” aimed at protecting the country from “dollar sanctions” by building up Russia’s gold reserves. Sputnik: The author of the article for “Die Welt” called gold ‘a perfect investment’ for Russia in the face of US sanctions. How much does this assessment correspond to reality? If it is true, why? Peter Koenig: Yes, Mr. Zschäpitz, from the German “Die Welt“, quoting James Rickards, makes some good points. 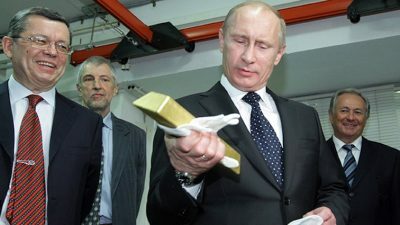 The fact that Russia is stocking up on gold is not new. They have been doing this for years, especially during Mr. Putin’s leadership and more so since the imposition of the totally illegal sanctions that are based on falsehood and fabricated reasons in the first place – and continue on fabricated reasons, mostly by the US and the UK. And to add injury to insult, the Swiss bank Crédit Swiss has just frozen roughly 5 billion dollars of money linked to Russia to avoid falling out of favors with Washington and risking sanctions. This is of course further increasing pressure on Moscow to de-dollarize as quickly as possible. Washington must know, of course, what these “sanctions” do. They are talking to Russian Atlantists – or Fifth Columnists – of whom there are still too many in Russia. And the sanctions against Russia are also propaganda-speak “we still command the world”. These sanctions call for de-dollarization – which is already happening, and this on a rapidly increasing scale, as Mr. Zschäpitz points out. At the same time as Russia is buying gold, Russian dollar reserves have been reduced drastically over the past years. They were replaced by gold and the Chinese Yuan (Renminbi) – since about two years the Yuan has been an officially recognized reserve currency by the IMF. The accumulation of gold, has made Russia the world’s fifth largest gold owner. They have increased their gold holdings from less than 500 tons in 2008 to almost 2000 tons in July 2018, including the latest purchase of 26 tons in July 2918. The Russian Ruble today is covered twice by the value of gold. The ruble is no fiat currency like the dollar-based western monetary system, including the euro. The ruble is a solid currency, despite contrary western propaganda. When the western media demonizes the Russian currency as having lost 50% of its value due to sanctions – it is a manipulated half-truth. The 50% loss of value as compared to what? – Compared to the US dollar and other western currencies? With a western de-linked economy – a 50% devaluation, or any devaluation is irrelevant. Being decoupled from the dollar, Russia will no longer be vulnerable to western sanctions – and no longer needs the western economy – which is already almost the case today. Russia has embarked on an effective “Economy of Resistance”. As President Putin pointed out already years ago, the sanctions are the best thing that happened to Russia since the collapse of the Soviet Union. They forced Russia to rehabilitate and boost her agricultural production for food self-sufficiency, and likewise with the industrial sector. Today Russia is not only food-autonomous, but is by far the world’s largest wheat exporter; and Russia has developed a cutting-edge industrial park, no longer dependent on ‘sanctioned’ imports from the west. And take this – as Mr. Putin pointed out, Russia will be supplying the world exclusively with organic food! All of this confirms that investing in gold as a reserve currency and in Yuan, is a move away from the western dollar economy – and towards economic sovereignty. Besides, Russia has had for years a Yuan-Ruble swap agreement with the Central Bank of China, a sign of close economic and trade relations. By the way – China has also been on a gold-buying spree for years. The Chinese Yuan is also covered by gold, plus by a solid national economy. Therefore, sanctions or ‘Trump’s tariff war’ have also only limited effect on China, if any. They serve more western anti-Yuan propaganda, alleging that tariffs and sanctions may weaken the yuan, thereby discouraging countries to buy yuans for their reserve coffers. It is a fact that the Yuan is rapidly replacing the dollar as a reserve currency. Besides, both Russia and China are part of the Shanghai Cooperation Organization – the so-called SCO – and along with 6 other countries the SCO encompasses already close to 50% of the world population and controls about a third of the globes GDP. – Dependence on the west is no longer necessary. Sputnik: The author also speaks about the growing importance of gold. What effect could its increased role have in the international financial system? PK: It is half-secretly speculated that as a last-ditch effort to save the dollar, the US may return to some kind of a gold standard, thereby massively devaluing the dollar – and the US international debt – all those dollars currently still in many countries’ treasuries as reserves. Having alternatives to dollars in a country’s reserve coffers, like gold and yuans, is of course a great defense mechanism. On the other hand, if such a move back to a kind of gold-standard by Washington, introduced by the FED and the US Treasury-controlled IMF, would take place – it would most likely boost the market value of gold – a good thing for those who have converted their reserves into gold. Those who would suffer from such a move are as always, the poor countries, those that are highly indebted by IMF and World Bank loans, and may now be asked to pay back their debt in gold-convertible dollars. Sputnik: What will happen to the dominance of dollar? What impact could it have on the US position on the world arena? PK: It would most likely accelerate the fall of the dollar, meaning the end of US-dollar hegemony. It would probably also trigger the fall of the US economy which depends so much on the dollar hegemony – on being able to pressure countries into their following by ‘sanctions’. I’m not a believer in gold as a sustainable ‘currency-alike’ in the long-run – because gold is also vulnerable to high-stakes manipulation and speculation. I more believe in a country’s economy as the true backing of a country’s currency. This is already happening in China, where the currency in circulation is backed by its strong economy. It may be soon, or is already, the case in Russia. The use of gold, in my view, is but a temporary measure, and will last as long as the world still believes in the godly and historic and ancient powers of this precious metal. Today only about 10% of the available gold is for industrial use, the rest is “reserve money” and for pure speculation. If the world discovers that there is about 100 times more paper gold – gold derivatives – in circulation than physical gold – this miracle perception of gold may disappear. If all the derivative-paper gold would be cashed in at once – guess what would happen? So, gold is good for now, but a temporary solution, in the longer run to be replaced by the actual strength of a country’s economy. Sputnik: Amid US sanction policy, there have been calls for switching to national currencies in trade and ditch dollar. How efficient is this approach? This is already happening. Russia and China are for years no longer trading in dollars but in local currencies, or even in gold, or in the case of China in gold-convertible yuan, especially for trading hydrocarbons, oil and gas. So are largely India, Iran, Venezuela and other countries that are eager to escape the dollar- hegemony with sanctions. I think one of the ways out of the nefarious neoliberal globalization, is returning to sovereign country economies, with local currencies and satisfying local market needs. External trade with friendly nations, that share similar cultural and ideological values. This is what China has done. China opened its borders to the west gradually in the mid-eighties, when she was self-sufficient in alimentation, health, education and shelter. And this practice is paying off until today. It is very difficult – if not impossible – to pressure China into anything – political or monetary – as Trump may soon find out – or knows already. China is fully autonomous and controls the Asian market, doesn’t really need the west in the long. What Mr. Putin said, about the sanctions being the best thing that happened to Russia – for achieving economic sovereignty – which is really the key, goes in the same direction. So yes, local production for local markets wit local currencies and trading with friendly nations – i.e. the SCO nations and nations participating in President Xi’s Belt and Road Initiative (BRI) is the future.